As a parent you want your child to have the best possible start in life. One of the greatest gifts you can provide them is a positive experience in dental care—especially visiting the dentist. Unfortunately, not all children are so lucky. Visiting the dentist for them is foreign and forbidding; it leaves such a negative impression they may avoid the dentist later in life even when faced with acute problems. It doesn’t have to be like that. 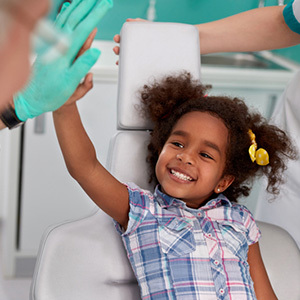 Here are 3 ways you can help your child have a great experience at the dentist. Start dental visits early. The best time to begin dental visits is before your child’s first birthday as their teeth begin to erupt. Dental diseases like tooth decay can begin as early as two months so it’s vital to detect any problems as soon as possible. Establishing an early relationship with your child’s dentist benefits you too with helpful tips and advice from them on dental care at home. And, children visiting the dentist early are more likely to become accustomed to it as a routine part of life, and more likely to continue the habit on their own. Find the right dentist. The right dental practice can make all the difference in the world for your child’s comfort level. Parents often choose a pediatric dentist who specializes not only in dental care for children and adolescents but in how to engage with them and put them at ease. The key, though, is to find a dentist and staff who work well with children and understand how to make them feel at home in their office. Display a positive attitude. You’ve probably already noticed how your child picks up on your feelings in different situations—which often affect how they feel and act too. So be sure when you visit the dentist with them you have a positive, proactive attitude, ready to partner with their provider in treatment and prevention measures. And above all display a calm and relaxed manner: your child will be more apt to follow your cue and relax too.